Wn05 la Madeleine plage, K.V.U.Gruppe Marcouf, K.V.Gruppe Cotentin Ost. 3./919 Grenadier Regiment. Oberts. Matz. 1 x R501 HQ's bunker..
1 x Tank turret ringstand Tobruk. 2 x 5cm KwK ringstand. 1 x 4.7cm Pak181 (always mistaken for an 88). 1 x 8cm mortar in a Vf206. R501 plus a defence Tobruk added, HQ bunker for the defence. An Allied intelligence air photo of Wn05. There can be seen a lot of activity on the defences in the sand dunes. The Red House is the square at the top of the beach. Exit 2 the main road to the west. 4.7cm Pak181 here at Wn05. 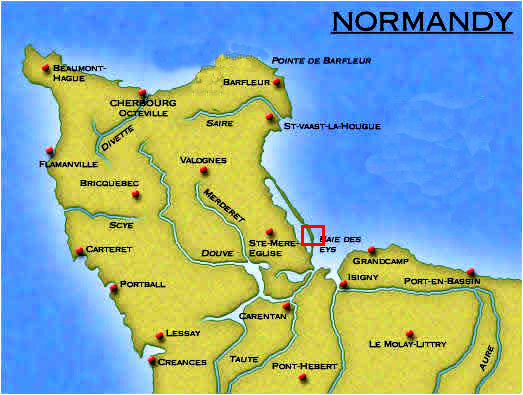 D-Day 06th June 1944. 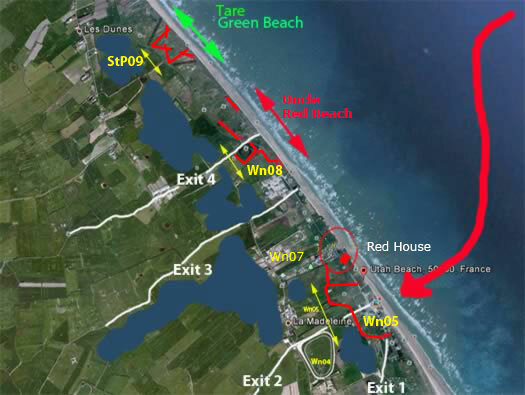 The attacking Americans were to hit Tare Green and Uncle Red Beach. The strong incoming tide running N/S down the beach, pulled the command craft south and also three of the four craft were either sunk or damaged. So the landing instead of coming in on Wn08/Wn09, two very strong defences. They came in on Wn05. A much weaker defence and also one that was heavily bombed around 6:00am. D-day : the loading of troops onto assault landing craft proceeded uneventfully. After the transfer, LCVP's circled the transports awaiting the order to rendezvous. At H minus 40 minutes (05:50) warships of the bombardment group of Task Force 125 began firing. 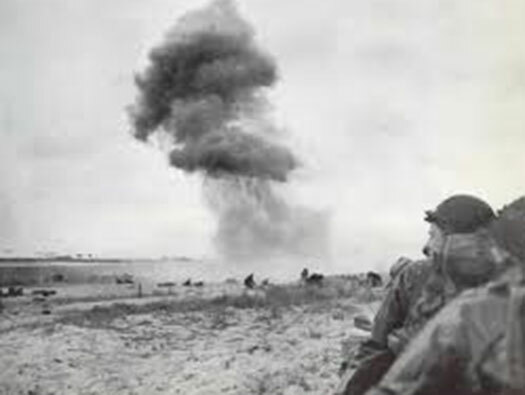 A few minutes later, 276 Marauders of the Ninth Air Force dropped 4,404 250-pound bombs on seven objectives on the beach, extending from les Dunes de Varreville to Beau Guillot. 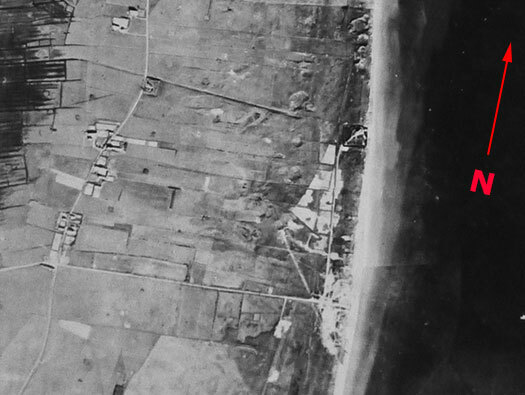 Les Dunes de Varreville seems to have received more bombs than any other target, possibly because the conspicuous antitank ditch surrounding the area persuaded pilots to unload on it when briefed targets could not be located. 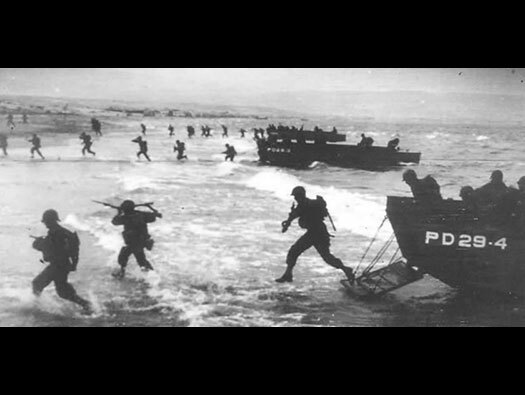 "The War Starts Here" The quote supposedly said by Brigadier General Theodore Roosevelt, Jr.
As assault craft started for the beach, the fire support group, consisting of thirty three variously equipped craft, began the process of beach drenching. Seventeen of these craft mounted rocket launchers and discharged their rockets when the first waves of assault craft were still 600 to 700 yards from shore. One of the earliest mishaps caused the immobilization of one of the control vessels. At approximately 0455 the Green Beach primary and secondary control vessels and the Red Beach primary control vessel left the Transport Area for the beach. The secondary control vessel for Red Beach fouled her screw on a dan buoy and was unable to proceed. An hour later, while still more than 7,000 yards from the beach and already 10 to 15 minutes late, the Red Beach primary control vessel was sunk, probably by a mine. Shortly thereafter an LCT behind the Green Beach primary control vessel also hit a mine and sank. The run into shore was already behind schedule, and these losses caused some of the landing craft to slow down. The Green Beach secondary control vessel therefore turned about to bring the landing craft in closer to the beach and announced that it would lead all amphibious tanks in. But to save time they were brought to within 3,000 yards of the beach and then discharged. 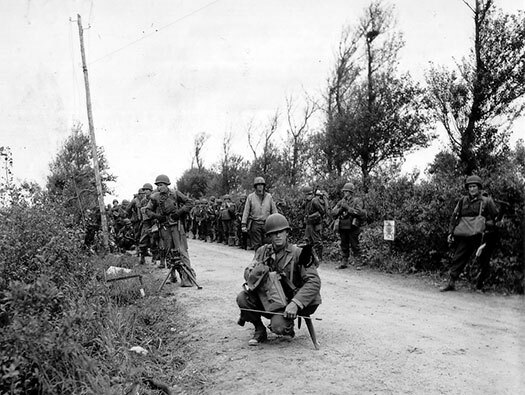 The first wave consisted of 20 LCVP's, each carrying a 30-man assault team from the 8th Infantry. The 10 craft on the right were to land on Tare Green Beach, opposite the strong point at les Dunes de Varreville. The 10 craft on the left were intended for Uncle Red Beach, 1,000 yards farther south. 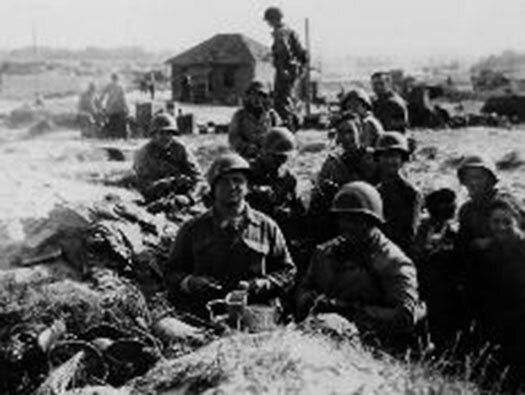 The entire operation was timed against the touchdown of this first assault wave, which was scheduled to take place at 0630. Eight LCT's, each carrying 4 duplex drive (DD) amphibious tanks, were scheduled to land at the same time or as soon thereafter as possible. 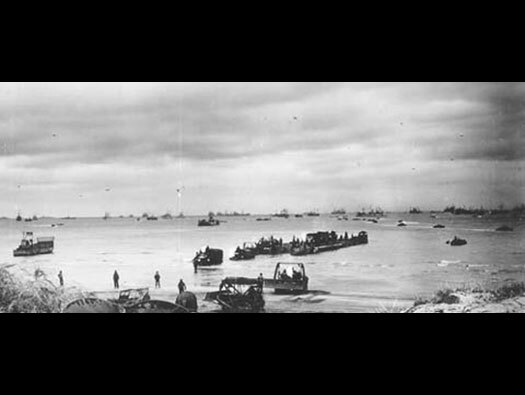 Coast Guard cutters off Utah Beach. These are very like the guide boats. This house should have been on the left flank of the landings but due to the error it was on the far right flank. As the sky line from the waters edge has no distinguishing features except this house, when Roosevelt and his officers saw it to their far right they new exactly where they were. The Red House from the sea. The garden wall surrounding the house and a stone built shed up against the sea wall. May have been a barracks for the soldiers. 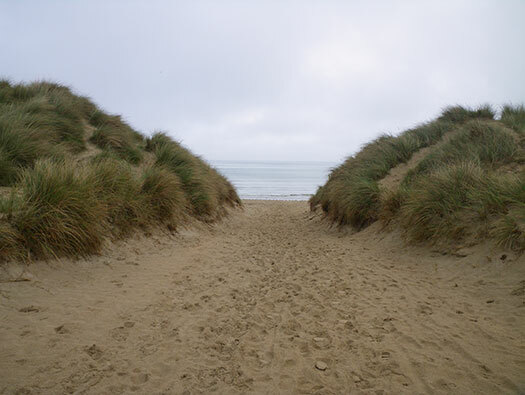 The view along the top of the sand dunes. Uncle Red in the distance. Vf1a shelter for six men. Lt Arthur Jahnke the commanding officer of Wn05 in his battle HQ just behind this sand dune had first to suffer an air attack by Marauder bombers dropping 250lb bombs right over his trench. He had to dig his way out due to a near miss. His 75mm F.K. gun was smashed and the 4.7cm Pak181 was damaged. 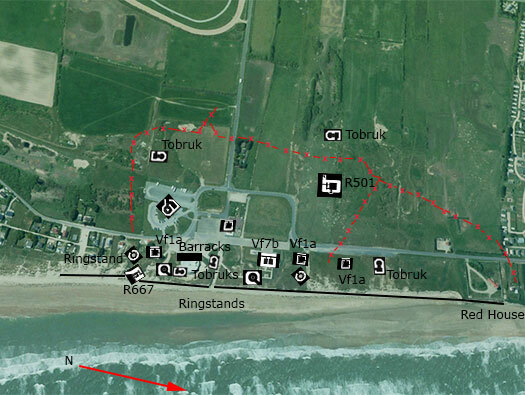 Two ammunition bunkers were blown up (these were not the Vf7a and must have been reserve ammunition stores in the dunes) and machine-gun nests badly damaged. Then rocket firing aircraft attacked. The one 7.5mm Reibel (f) armoured car guns and destroyed them (Tobruks with tank turrets on the top). Around 06:00 the Destroyers started shelling. Vf1a at Wn99 Polder du Grand St-Andre. Ringstand with a 5cm KwK L/60 gun. The old field gun was smashed and its crew killed. Now only the damaged 4.7cm Pak181. The main barrage opened up from the navy. Trenches were levelled, barbed wire, mines and bunkers blown up. The telephone exchange was a right off. The fire control post for the flame throwers took a direct hit. Then they saw the landing fleet on the horizon. Lt Jahnke sent a runner to ask for the 122mm battery of 1261st Art. Reg to put down a barrage. The runner was killed by a fighter bomber. The message never got through. Plan of the ringstand seven ready ammunition niches around the wall. At 06:20 hrs as the first landing craft ran aground at about 500m, Lt Jahnke ordered 'Open Fire'. Inside the tank turreted Tobruk was Lance-Corporal Friedrich who started to fire upon the troops as they landed. 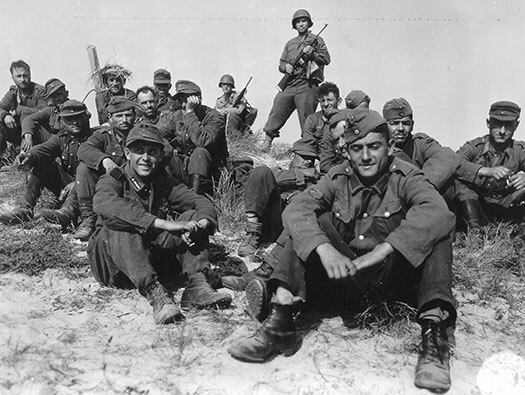 His and another machine gun made these men dive for cover. The 80mm Mortar opened up from its Tobruk. Then strange amphibious monsters started to drive out of the water and their screens dropped to show swimming (DD) Sherman tanks. The 4.7cm Pak181 at last fired. A Sherman slued and stopped. That was the only round fired by the gun. It had been damaged by the bombing. Note the hand holds on the side of the ringstand entrance, the same as at Wn01 Grand Vey's ringstand. Now Friedrich’s machine gun was the only one keeping the advancing troops heads down. The 80mm mortar having been put out of action. Concentrated fire onto Friedrich’s turret then put that out of action too. He was wounded but survived the war. Last resort - send in the Goliath tanks. This is a very interesting photo of the American soldier on guard. The 5cm KwK L/50 looking in very good condition in its Nr1694 ringstand. 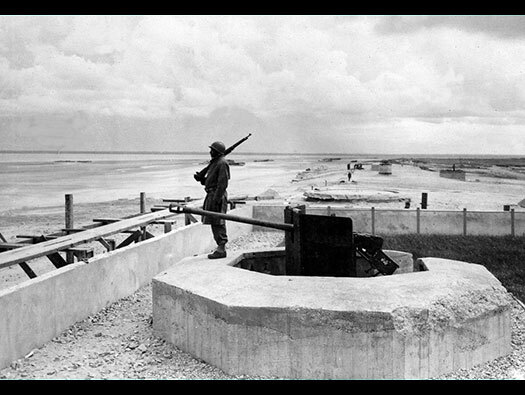 The picture was taken in 1945 as the bunker and ringstand were being made into a memorial. You can see scaffolding around the front. Behind the 5cm KwK is the 7.5cm F.K.38´s ringstand and several Tobruks can be seen. 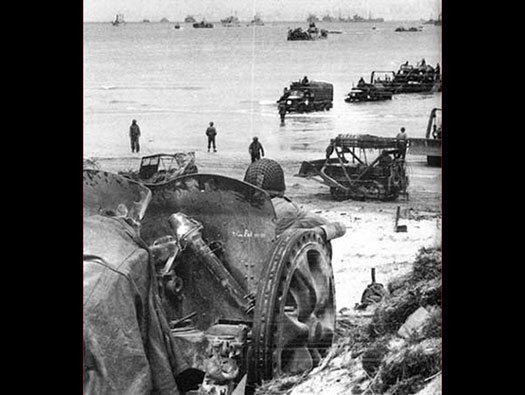 Goliath tanks -remote wire controlled tanks filled with a large amount of dynamite - rumbled down the beach only to go wrong as the concussion from the bombing had damaged their internal electronics. None reached their targets. Lt Jahnke had nothing left to fight the invaders with. Assault teams started to blow the tank wall. Then a a shell landed next to his trench Lt Jahnke was in and made him unconscious. The next thing he felt was somebody pulling at his feet. Suffering from concussion and covered in sand, he found it was an American that had saved him. Instinct from fighting on the Russian Front told him to defend himself at all costs. He felt for his sub machine gun but an American kicked it out of the way, helped him up and gave him a cigarette. He was taken to England as a POW that evening. Goliath tanks on Utah Beach. Goliath tanks were hidden in revetments in the sand dunes ready to move out and destroy a tank, a landing craft or a large group of soldiers. There are many memorials here. Vf7b covered entrance to the double ammunition store. Ic125 emplacement for the 80mm mortar. Ic125 bunker for an 8.14cm Gr.W.278(f). Ic125 80mm emplacement with ammunition space on the left. Ic125 80mm emplacement gun room. Ready ammunition storage around the emplacements walls. The Ic125 emplacement - Pictures of target designators make firing easier. Sergeant Hein took over the mortar and started firing as fast as he could but he was seen by the ships off shore and was gradually shot out of the emplacement. ['Invasion They're coming' Paul Carell]. 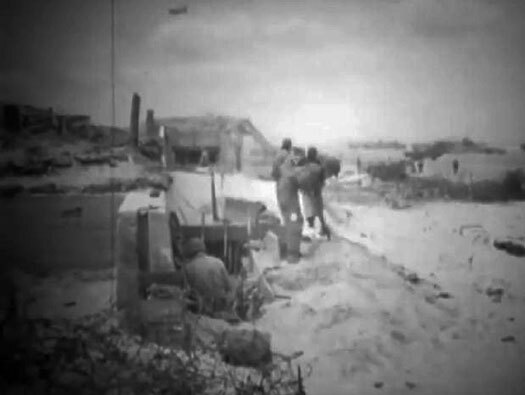 A picture from Wn73 Omaha beach. USS Hobson off Utah Beach on counter battery and direct fire duties. Ic125 80mm mortar emplacement view over the lip and there may have been a view to the sea? Feldmassig, this was a sort of barracks for the men, where they would live, sleep and eat. The Vf's would be sleeping accommodation for more men as numbers gradually increased and the new style of bunker construction came on. This may have been Lt. Arthur Jahnke's command post although Carell says it was a wooden framed hole in the sand. This is a Feldmässing at Wn73 Omaha Beach. Feldmässing, now inside the museum. Feldmassig. Passing through one of the doors it now looks nothing like it would have. This type of Feldmassig was used extensively either dug into he ground or covered over with earth and always facing away from the enemy. 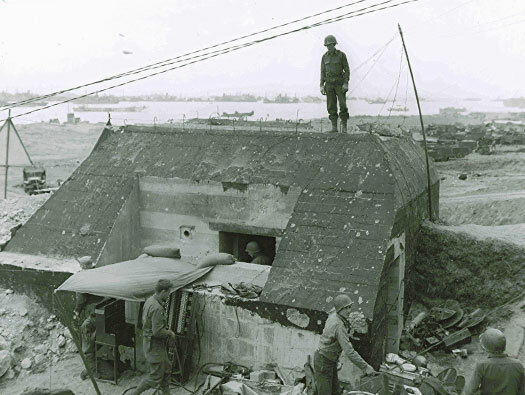 This is a Feldmassig at Wn73 Omaha Beach. I have found several of these buildings along the Atlantikwall. Feldmassig plan of this building. Pz.Drehturm FT tank turret for an MG311(f) Reibel machine gun. I am not sure the Tobruk it sits on is correct. Pz.Drehturm FT tank turret for an MG311(f) Reibel machine gun. This is like the turret above but on a U shaped Tobruk and could be the one Lance-Corporal Friedrich was in. ['Invasion They're coming' Paul Carell]. U shaped Tobruk at Maisy. Inside the museum an B-26 Marauder a bomber ideal for low level medium bombing. 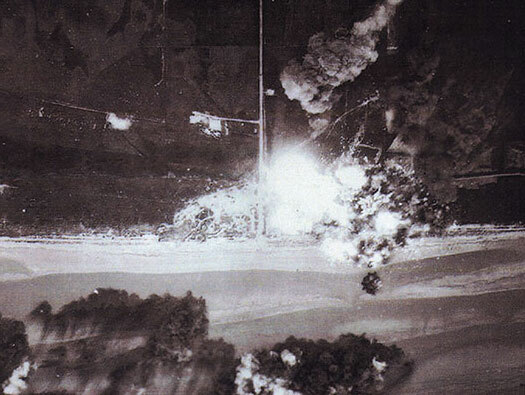 They were tasked to bomb the defences of Utah Beach on the morning of June 6th 1944. Vf1a shelter for six men and was converted cunningly into a toilet block for the museum. The museum and a couple of Trotters. Two other famous Trotters (for Pete). Ringstand for a 5cm KwK L/60. R667 casemate for another 5cm KwK L/60 gun. 5cm KwK inside an R667 casemate. 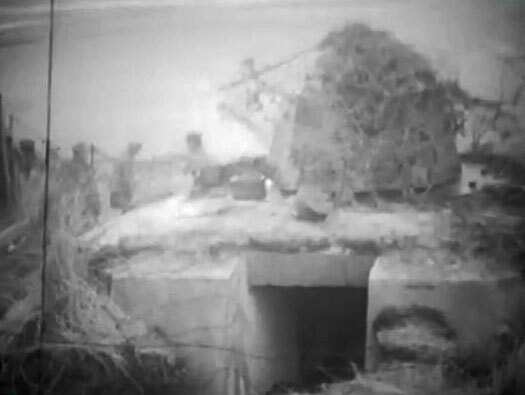 R667 casemate for another 5cm KwK L/60 gun and the sea wall. Firing on ships from the shore batteries. The view out to sea. The tide is about mid way in/out and it shows how far the first wave of infantry had to run in onto Wn05 on that cold June day. Vf1a shelter for six men, now a small museum at the café. I believe you can ask at the cafe to see the bunker. Vf1a shelter for six men, now a small museum at the café. Vf1a shelter for six men inside now a museum. The Americans took it over as a Comms room and that is how it is depicted as the museum..
R501 Gruppe shelter. 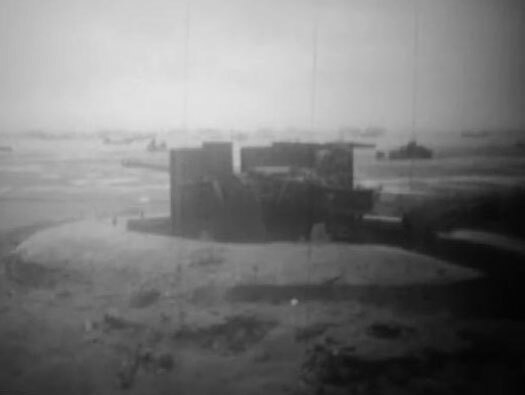 Behind the beach is the R501 with a Tobruk attached. R501 with a Tobruk attached. R501 Gruppe shelter. The entrances into the Tobruk and the bunker. R501 Gruppe shelter showing the added Tobruk and a flanking wall. You can see how it has been added on. You can also see the hooks left on the top of the wall and bunker to hook on a camouflage net. Most R501's I have seen do not have either a flanking wall or a Tobruk. R501 on this side is the escape. The square block and you can see an iron step leading out of the escape and a chimney for heating. R501 Gruppe shelter: these are the steps down into the bunker and the close combat embrasure which covered them. Then there is a right turn through a 434P01 strong steel door. Next turn left into the bunker through a 19P7 thin steel door. Outside of the barbed wire defence is this Tobruk covering the entire rearward defence. It is a very isolated post. How the Tobruk would have looked, completely buried and only the lip showing. Wn05 la Madeleine plage. Up to here the German side, now I will show the American side. Wn05 la Madeleine plage D-Day. About 06.00 D-Day. Marauders starting the bombing from north to south and the bombs are starting to walk down the defence. This is the time that Lt. Janke was first buried in the sand. RAF Chipping Ongar was known as USAAF Station AAF-162. Four B-26's parked on the scissor dispersal prior to D-Day. RAF Chipping Ongar air photo. 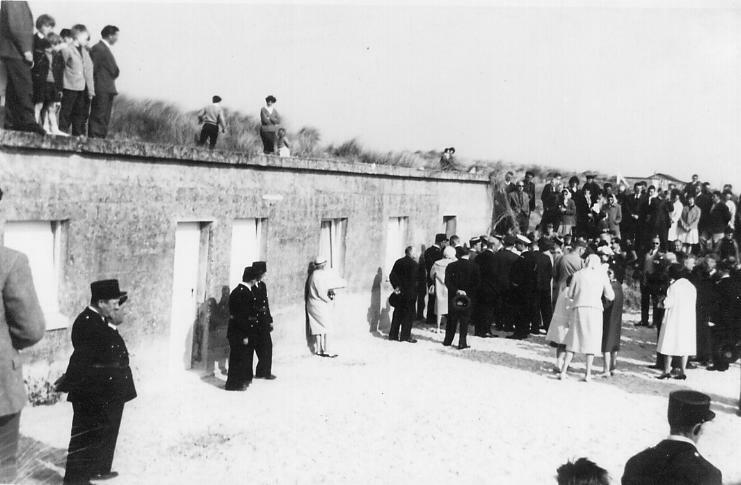 One of the only reasons why Britain has so many aerodromes was to attack and break through the Atlantikwall. A piece of concrete from Wn108. (H.K.B 346 1942?). The Resistance Nest was being altered from four open emplacements to four R669 casemates. These were not completed in time. At 05:30: Lt. Janke orders the 1./1261 battery at St Martin-de-Varreville (Wn108 - 4x12.2cm K390/2(r) guns)_____________His field telephone has been damaged in the bombing though so he sends a runner on a bicycle. The runner is killed by fighter bombers so no message gets through. Janke fires off his signal flares. The battery at Wn108 has been bombed completely out of action. Paratroops from the 101st Airborne also attack only to find the position has been abandoned. 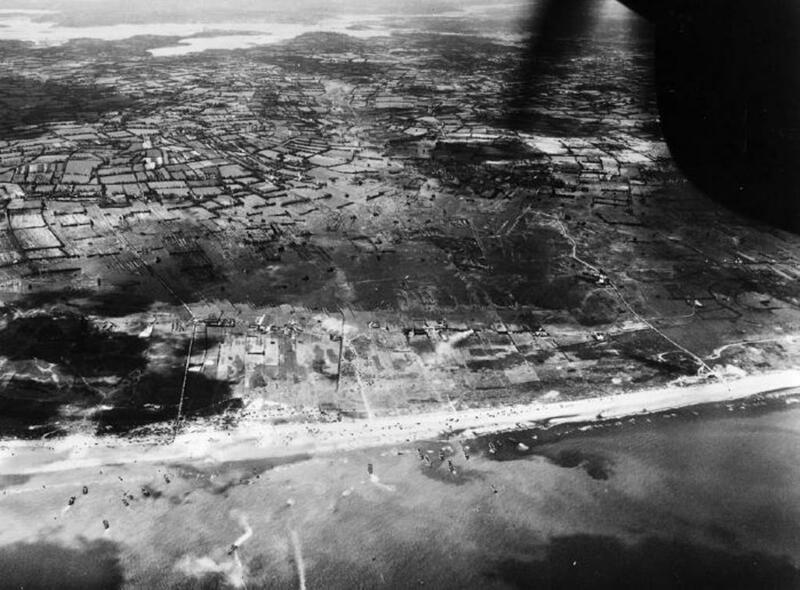 Possibly Slapton Sands prior to D-Day. 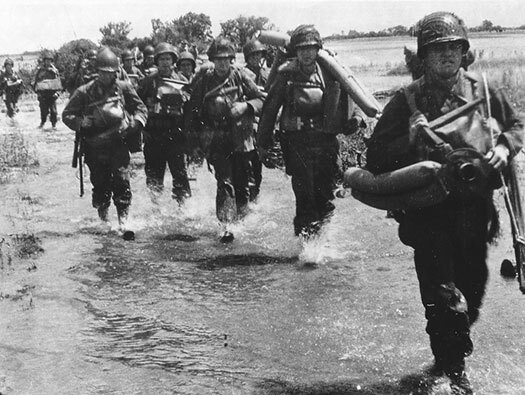 The infantry touch down at 06.30 D-Day. The defenders were taught not to fire until the advancing soldiers get into the fire cones of the machine guns. They started firing but most were by then bombed out or damaged and almost only the machine gun of Lance-Corporal Friedrich was left to hold back the hordes. 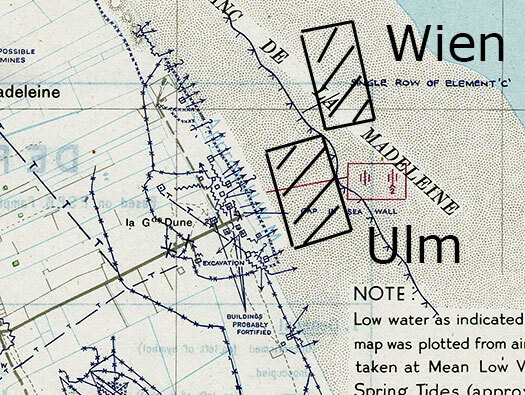 A reconnaissance picture quite early on on D-Day morning. Landing craft coming in at Wn05. 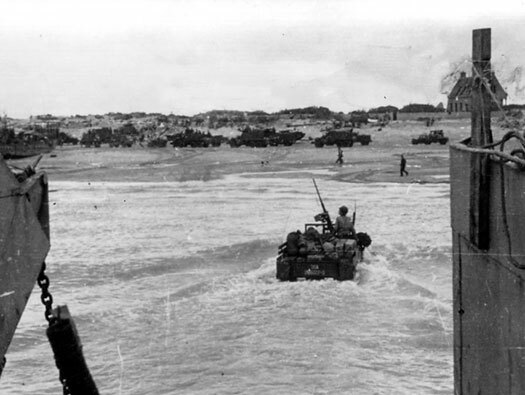 The DD Sherman tanks swim ashore. Sherman tanks and tank destroyers wade ashore. 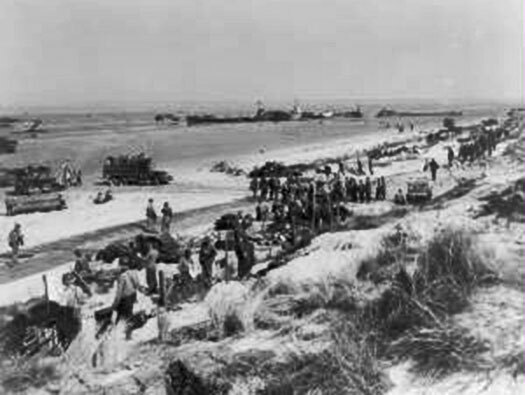 Half-tracks with 105mm guns (Howitzers), an amphibious Jeep and some lorries also arrive. 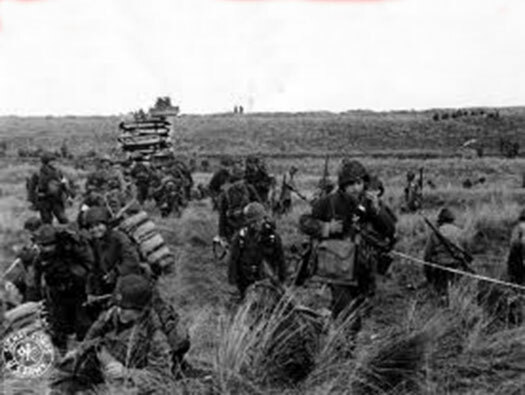 Infantry start to cross the sand dunes. There is some white tape on the right which the infantry have to follow and the other side was what looks like a minefield. There are soldiers with mine detectors working the area. More vehicles trying to exit the beach, long traffic jams build up as there is not enough room inland for them due either to the inundation of water and not enough land capturers for the vehicles to get too. Bulldozers landing from a landing platform, an LCI just leaving the beach and a gaggle of DUKW's coming in. DUKW's came in pre loaded with ammunition, fuel and food and could unload and then return and loads in heavy nets craned into them for another trip. This went on for many days. Digging in on the sand dunes:. I believe the building that can be seen here is now the CafÃ© and the Vf1a behind it. The troops have a half round white stripe around their helmets. This means they are beach party soldiers and are allowed to stay here. Anybody without the white on their helmet has to get off the beach. The advance off the beach crossing the inundated area. Moving inland and checking for mines. Note the minefield sign on the hedge. The new owners of the R667 casemate who are now using it as a command post. Senior Naval Officers leaving the comms bunker. The 4.7cm Pak181. It is often stated that there was an 8.8cm A/T gun. 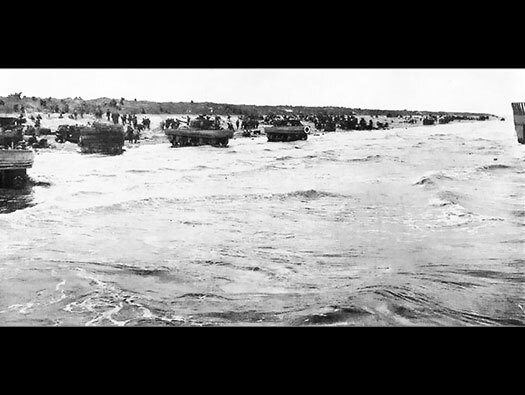 Vehicles driving ashore through the surf. 4.7cm Pak181 captured by airborne forces and looks very much like the main picture. The beach gradually filling up and settling down to moving from an assault force to a backup force, delivering everything an army needs. As the morning drew on, German artillery inland started to fire upon the beach. The 12.2cm guns at Wn108 had been completely neutralised. The field batteries at Brecourt Manor and Hiesville were eventually knocked out by the 101st Airborne so that all that was left were the guns at Crisbeq - two 21cmK.39/41 in casemates, and I think, one in an open emplacement. These guns fired on Utah but did not have a forward observation officer or any fire control, so were all firing on pre-determined map reference points. Crisbecq's open emplacement showing the code names Odysseus, Odol targets off of Quineville. Further around may have been Wien and Ulm right opposite Wn05. Bigot map of Wn05 with the two artillery pre planned targets. This could be where the above photo explosion corresponds with. Guns inland firing onto a DF target like Ulm or Wien. A roadway built and materials starting to be brought ashore. When an army goes from blowing everything it sees up to gradually building back the infrastructure. You know the war is turning for the better. The captured and now relatively safe. They would be sent back to England. Plan of the original German sea wall with just enough space between the walls to walk through. The left side has been blown up to allow traffic off the beach. Wn05 la Madeleine plage Today.